Huge projection screens, rows of reclining chairs, special lighting, and a number of powerful speakers strategically positioned around the room – these are the things we most often associate with some high-end home theaters. But everyone has their own preferences and requirements, so no two home theaters are ever exactly alike. 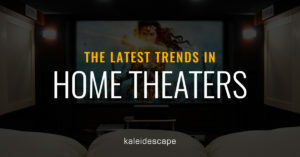 More than that, as trends in this industry continue to change, we can expect to see a lot of the standard expectations about home theaters change, too. And, after looking at some of the current trends, we can see where this industry could be going. Many people assume that a projector is necessary to get that real “theater” feel, but that might not be the case anymore. The television versus projector question is one that every home theater owner is going to have to face eventually. While projectors deliver the bigger screen and a definite theater feeling, a lot of home theaters are trending toward televisions. There are 60” and 75” TVs that can provide a great viewing experience, and the smart TV options are contributing to another trend we’ll cover in just a moment. So which way is the industry trending – to projectors or televisions? It depends on how you look at it. Televisions have definitely been the choice for home theaters that don’t have a lot of room, and can’t accommodate a 100” screen. On the other hand, projectors can really make 4K resolution shine. The prices on these devices have also become more affordable, and the newest designs make it possible to use them in locations where you couldn’t before. As the prices for great home theater equipment come down and become affordable, it makes a true home theater experience more attainable for more people. Of course, more affordability doesn’t automatically mean more space. So, even if people can get the necessary equipment, they might not choose to dedicate an entire room to a single purpose. Hybrid rooms and multi-purpose media rooms are perfect for marathon sessions of the latest video games, binge watch the latest TV shows, playing some ambient music while reading, and a wide range of other activities. These rooms may look less like a traditional theater and incorporate some sofas our lounge chairs. They use lighter colors and a more open feel, so it can be used for many activities throughout the day. The standard remote control is a very utilitarian device, but we’re trending toward new types of controls that offer a lot of different options. Apps on your tablet or smartphone can make it easy to control everything about the viewing experience, from choosing a movie to dimming the lights. The current “latest thing,” though, isn’t about using a second screen to choose your movie, but using your voice to tell your system what you’d like to watch. Better yet, just tell it what mood you’re in and let it pick the perfect movie for you. We’re seeing huge companies invest huge amounts of money, research, and development into voice control, active learning, and other technologies that make your home theater a whole new experience. Is Streaming the Way to Go? Streaming services have made it extremely convenient to consume your favorite types of entertainment. That doesn’t necessarily make them the best choice for a dedicated theater experience, though. The reason is simple: between the streaming service and the home, there is an occasional impediment that is referred to as an Internet Service Provider. So, while the mainstream trend is away from shiny discs and toward the convenience of a digital service, home theaters are still looking at their options. The thing is, true 4K UltraHD is really difficult to deliver through a streaming service. The master 4K movie has a ton of video and audio information, and transmitting it all – at a consistent rate – is difficult. Even the best Internet Service Providers will experience fluctuations in their ability to deliver consistent data speeds. Physical media remains the most reliable way to guarantee a true 4K viewing experience. But since discs are also inconvenient to purchase, unpack, play, and safeguard, many home theater owners are looking at different options. Full digital downloads offer a simple way to ensure the highest quality while offering the same convenience of streaming services. Devices like the Kaleidescape Encore can play movies at 60 fps with lossless audio, store hundreds of Ultra HD movies (or thousands of DVD quality movies), and make them all available through a simple and intuitive interface. These devices may also change the way we consume media in these multi-purpose home theaters. By manually bookmarking all the songs in the movie or the most interesting/action-packed/romantic scenes, you can easily jump to your favorites. While the rows of theater chairs and massive projection screen are the traditional image of a home theater, recent trends have shown that this isn’t always necessary. Multi-purpose media rooms and large UltraHD televisions are turning up just as often. The latest trends have made it possible to build a home theater in a smaller space and still get an amazing experience every time you gather together for your favorite movies.